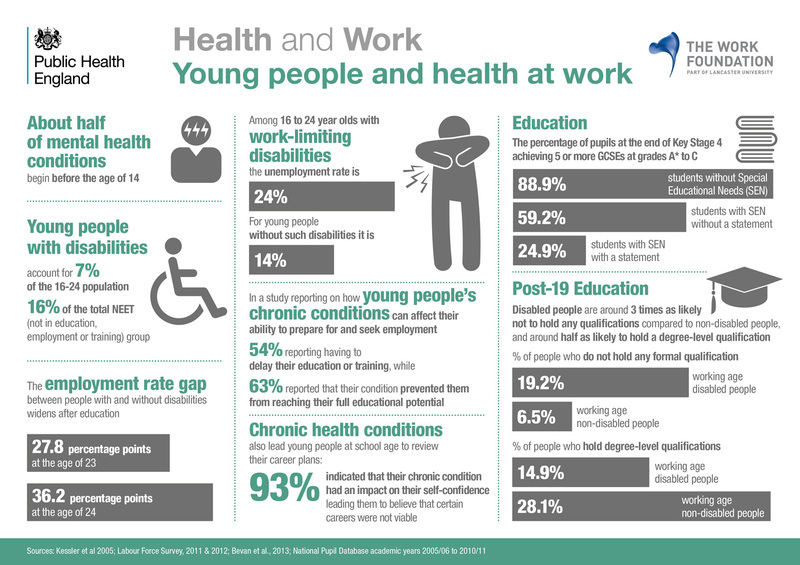 Young people with disabilities account for 16% of the total of people not in education, employment or training. Among 16 to 24 year olds with work-limiting disabilities the unemployment rate is 24%, compared with 14% for young people without such disabilities. Chronic health conditions also prevent young people from pursuing education or workplace training: 93% believe their ambitions are not viable. As with other employees, young people with health conditions are covered by disability discrimination law in the workplace, under The Equality Act 2010. However, there are also specific employment rights and health and safety considerations that employers must adhere to when employing young workers (those under the age of 18). Two days off per week. A daily rest break of 12 consecutive hours (the break between finishing work one day and starting work the next). A rest break of at least 30 minutes if the working day lasts more than 4.5 hours. Working time of no more than eight hours a day and 40 hours a week. Not work at night – however, there are some exceptions. At least the National Minimum Wage at the relevant rate for 16-17 year olds. When employing young workers under the age of 18, ACAS states, employers have the same responsibilities for their health and safety as they do for all workers. However, according to the European Agency for Safety and Health at Work, statistics show that 18- to 24-year-olds are more likely to have a serious accident at work than older adults. They may be exposed to poor working conditions leading to the development of occupational illnesses while still young or later in life. employers not recognising the additional protection that young workers need.